Recycled shoes use a variety of materials. Recycled footwear is an exciting alternative, combining green living principles with fashion and style. Many environmentally minded companies and designers are turning their attention to footwear and seeking new ways to make shoes that are both attractive and practical, yet conform to the requirement for low-impact living. Traditionally made shoes can have a high environmental cost. Not only do they use a lot of virgin materials, which use many resources to grow and manufacture, they are often made overseas and imported into the U.S. There are many issues surrounding the manufacture of footwear overseas and debates have taken place over the ethics of the low pay often given to workers. In addition to this, there are the issues of transporting footwear many thousands of miles to the U.S and therefore leaving a significant carbon footprint. 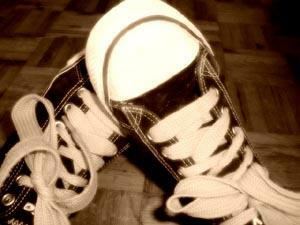 Another green issue surrounding shoes is the fact that they are difficult to recycle. Many shoes are made of multiple components, for instance leather, plastic, rubber and resin, each of which has special recycling requirements. The necessity of breaking down the individual parts of a shoe for recycling makes this impractical. Many local authorities do not accept shoes for recycling, meaning that many end up in landfills. Even single component shoes such as Crocs generate recycling issues. Taking the above points into account, some innovative green companies and designers are seeking a solution to this challenge. One way of neutralizing the negative impact of the recycling issues of shoes is to make shoes using recycled footwear. Recycled footwear is made from a variety of materials, however often feature the rubber from old tires for soles. Other materials such as canvas and fabrics are used from a variety of sources. One UK company, Worn Again, makes shoes using 99 percent recycled material including discarded suit jackets (outer, lining and buttons), parachutes, prison blankets, ex-military long johns and towels, car seats, scrap leather and recycled rubber. No two pairs of shoes are exactly the same. Other recycled shoe retailers inlcude JadePlanet.com and VeganEssentials.com. While shoes made from recycled materials face the same end of life issues regarding their own recycling, the fact that they were made from discarded material means that they helped keep this out of landfills. In addition to this, being made from recycled materials also means that minimum precious resources were used during the growing or manufacturing process. If you are feeling very green, then it is possible to make your own footwear. Instructions are given at HollowTop.com on how to make your own sandals out of tires. These are a good way to recycle rubber and the soles should have a good grip, making them practical to wear. Additionally, it is easy to breathe new life into footwear. Rather than cast off a pair of shoes, how about passing them to a charity shop for recycling, or add a bit of decoration and get further wear from them yourself. Canvas shoes can be adorned with beads and embroidery, and leather shoes can be adapted with bows and buckles or even dyed to new colors. Most shoes benefit from a good cleaning, and footwear that may at first glance appear past their best may well scrub up and look almost new. Some shoes, such as trainers, can be washed in the washing machine. Use an ecologically friendly detergent, such as Ecover, and wash on a gentle setting. Leather shoes will benefit from a good polish with an organic wax polish. Leave this on overnight to allow the wax to soak into the leather. If you are not feeling creative and you have shoes with a bit of life left in them, consider selling them for a few pennies on eBay.com. Finding good alternatives for recycling footwear is an important part of green living and with a bit of thought there are plenty of creative solutions to be found.